Powermatic controlled, concealed door closers have been used to great effect on one of the newest apartment buildings to grace the banks of the River Thames. Situated at Millbank and enjoying spectacular, unrestricted views of the Thames, Riverwalk House has been designed by award-winning architects Stanton Williams for Ronson Capital Partners. Its architecture is inspired by the sinuous curves of the river as it winds past the site. The building’s gentle interlocking form creates an open aspect for the 116 residential apartments and penthouses, maximising natural light and internal space. The high aesthetic quality of the building’s stunning limestone, bronze and glass exterior is continued inside; created by United Designers, the interior features a light, airy décor scheme, tastefully detailed with contrasting dark stained oak apartment doors and surrounding panels. 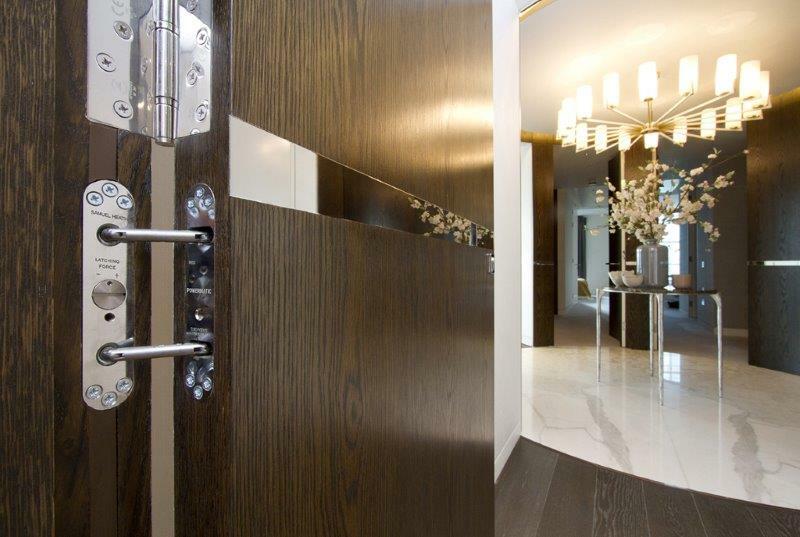 This rich dark wood theme has been extended to apartment interiors, with concealed fittings allowing doors and panelling to be shown to their luxurious best. Conscious of the need to retain this high-spec appearance to doors and interiors, Stanton Williams specified Powermatic concealed door closers for entrance doors to the individual residences. Doors were supplied and fitted by Ruddy Joinery, and mortices routed on site to accept the door closers, which were supplied by leading architectural ironmonger, Franchi plc. Powermatic door closers are totally concealed when the door is closed and barely noticeable when the door is opened, although the polished chrome face plates selected for Riverwalk do ensure that, if seen, the door closers will complement the doors’ polished metal detail strips and other door furniture. This concealment ensures that the appearance of the high quality dark wood doors and interior finishes is not spoiled by intrusive mechanical arms and control boxes that would be an unavoidable consequence of using surface mounted door closers.